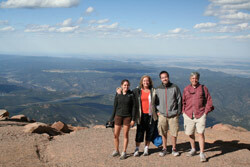 Kathleen, Leigh, Matt, and Jim Muller on the top of Pike's Peak. I am a wife, a mother, a daughter, a friend. I think I may be a writer, but I am too afraid to voice those words. I have nothing to go on, only a feeling, some terrible poems I wrote in sixth grade, a few decent essays in high school and college, and again, this tug to pick up a pen and write. Perhaps even stronger than my need to write is the responsibility I feel as that wife, mother, daughter, friend. Writing takes hours a day; when I’m not physically putting down words, I am writing them in my head. What starts out as a tug turns into an embrace and I don’t feel I can be this selfish with my time. So everything else, everyone else, comes first. But at 2 am, the feeling isn’t a tug; it’s a drill sergeant shaking me awake. Characters flick on the overhead light in my brain and I can no longer sleep for the glare and the noise. They grab my hands and pull. Careful not to wake my husband, I slip out of bed and take a legal pad and pen downstairs. A couple of hours later, I have the beginning of a novel.